A board-certified Internal Medicine specialist, Anzhela Dvorkina, MD, is a firm believer in providing you the quality care that’s right for you. She offers an old-fashioned but everlasting atmosphere of trust and comfort at the Century Medical and Dental Center. Dr. Dvorkina also provides wellness education during your visit. She advises you on how to live up to your full potential. She also teaches you different ways to prevent diseases for both the short-term and the long-term. 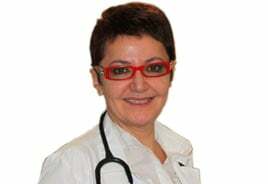 Dr. Dvorkina obtained her medical degree from the Petrozavodsk State University, Faculty of Medicine. She completed a fellowship in Obstetrics and Gynecology at the Saint Petersburg State Pediatric Medical University and another fellowship, in Internal Medicine, at the Brooklyn Hospital Center. She’s a member of the American College of Physicians. She’s been practicing in the U.S. since 1997, treating patients as a primary care physician. She’s fluent in English, Georgian, Ukrainian and Russian. Come in for a consultation with Dr. Dvorkina.